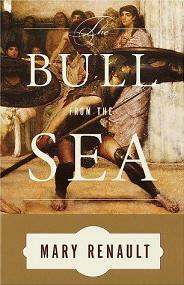 Mary Renault’s _The Bull from the Sea_ takes up where _The King Must Die_ left off and continues the legendary story of Theseus and his kingship of Attica. There are some differences between this volume and its predecessor, most notably in the fact that the scope of this tale is much broader. Whereas the first volume concentrated primarily on Theseus’ youth and time in the bull ring of Crete and covered the time involved in a fair amount of detail, this volume is much more a précis of many events, covering a much wider range of time. Important events and periods are singled out, however, and expanded upon with more than enough detail to satisfy. I never had the sense that the tale was in any way rushed or incomplete and the broader scope perhaps allowed for a more elegiac tone to the novel, which is appropriate given the ending to Theseus’ tale. This is a memoir giving the wider story of Theseus’ kingship and deeds after the defining moment of his youth has passed. Another thing that struck me with Renault’s Theseus saga (and this volume in particular) was the deft way in which many other legends and tales from ancient Greece were woven into the fabric of his tale without taking anything from the tale being told, but also without detracting from their own importance. These include the legend of the famous bard Orpheus, the tragedy of the king Oedipus, the existence of the Centaurs and the apparently contradictory traditions of both their training of the heirs of kings and almost bestial gluttony and lust, the tale of Jason’s quest for the Golden Fleece, and even echoes of the coming Trojan War in a cameo by the young hero Achilles. As with _The King Must Die_ Renault is able to retain the mythic stature of these stories while making them much more ‘realistic’.